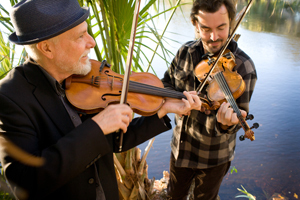 Fiddlers David Greely and Joel Savoy of the GreelySavoyDuo have deep Cajun roots. Both come from south Louisiana. David took up the fiddle at age 17, after hearing Richard Greene of Seatrain play fiddle through an amp with a wah-wah peddle in a concert at the Warehouse in New Orleans. He went on to co-found the Mamou Playboys in the late 1980s and spent more than two decades in that band, traveling around the world, searching archives for tunes, writing songs, making records, and getting nominated for four Grammies. “I find my emotions moved more by Cajun melodies than by any other form of music,” David says. “It’s a blend of ancient tones, black, white, and rural. It’s rooted in the French language, so its rhythms tend to swing. In it I find everything I need to express myself musically.” Joel is the son of Marc and Ann Savoy, in other words Cajun music royalty, and a longtime member of the Savoy Family Cajun Band. He’s played with Darol Angor, T-Bone Burnett, Allison Krauss, Steve Miller, Tim O’Brien, and Linda Ronstadt. In the words of fiddler and banjo player Dirk Powell, Joel “can switch from sweet, sultry soulfulness to jaw-dropping complexity in a heartbeat. He never fails to leave his audiences moved, dazzled, and, more often than not, completely smitten.” In the deep-rooted Cajun tradition of immediate invention, two acoustic fiddles freely dance around melodies ancient and new. 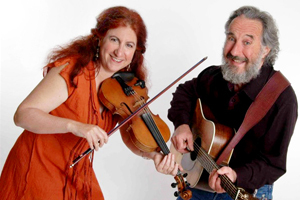 Berkeley’s own Eric & Suzy Thompson are two of the most versatile musicians around, with a repertoire that stretches from old-time Appalachian story songs and bluegrass breakdowns to Puerto Rican paso dobles and traditional Cajun melodies. Eric’s flatpicking is famed for its purity of tone, speed, and soulfulness. Suzy is a powerful singer, an award-winning fiddler, and an accomplished accordion player. Their latest album, Dream Shadows, continues their long-standing love affair with the pre-war music of the rural American South, at the intersection of country blues, string band music, and Cajun dance tunes. Eric & Suzy will celebrate he late, great Danny Poullard’s birthday – which, they know, is actually January 10th – with a set of Cajun and Creole music, including many tunes that they played with Danny in their days together with the California Cajun Orchestra – plus some unusual songs learned from super-rare 1920s Cajun recordings. Plenty of room to dance, plenty of room to sit and listen.